This is the fourth volume in this popular biennial series designed to help medical physicists, technically inclined physicians, and other professionals stay current in medical radiation science and technology. 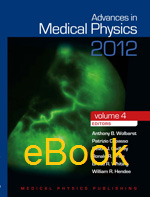 This volume is particularly strong on the topic of imaging and computerized tomography, with 12 of the book’s 20 chapters dealing with the physics of imaging or radiation dose assessment in CT. Many chapters begin with a short history of the technology in question, followed by the latest developments on the topic.